"Over the last year, membership in Unitarian Universalist Association congregations and attendance at Sunday services dipped slightly, although over the last decade, membership has risen 3.1 percent and the number of UUA congregations has increased." One can't help but wonder just how many card-carrying Unitarian Universalists actually attend Sunday services at UU congregations when one considers that a certain percentage of church attendance consists of non-UUs of various kinds. "Enrollment in religious education programs, however, declined for the fifth year in a row, and is down 11.2 percent over the past 10 years." I take note of the fact that the report does not provide the actual numbers of children enrolled in UUA religious education programs. The consistent, significant, and apparently ongoing decline in this important UUA demographic does not bode well for the future of Unitarian Universalism at all. 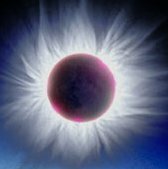 . .
"UUA membership as of February 2012 was 161,502, down from 162,796 in February 2011. The highest membership figure in the past 10 years was in 2008, when UUA congregations reported membership of 164,505." This means that UUA congregations have lost over 3000 adult members within the last four years. How ironic that the Unitarian Universalist "church" has continued to steadily decline since electing the U*U minister who after bluntly, but very aptly. 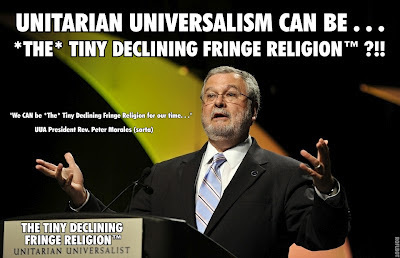 . . described Unitarian Universalism as "a tiny, declining, fringe religion" in his stump speech announcing his candidacy for UUA President proclaimed that Unitarian Universalism *can* be "the religion for our time". It is abundantly evident that, so far. 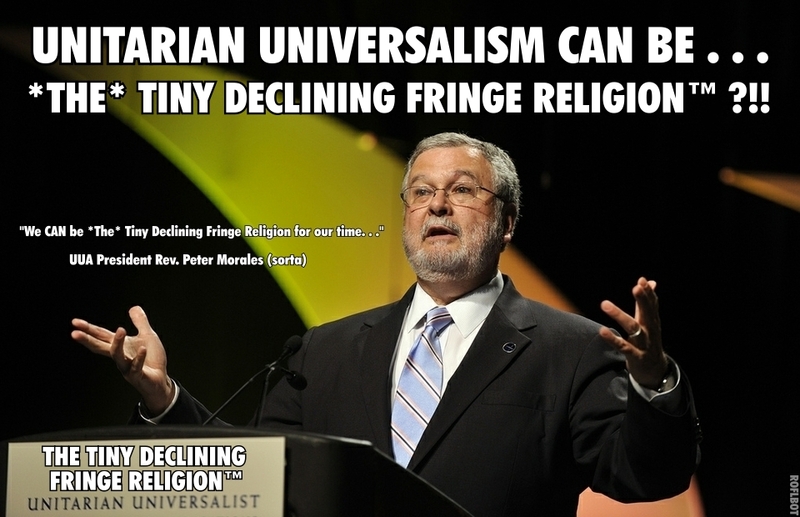 . . UUA President Peter Morales has failed miserably to live up to his "less than realistic" campaign slogan. "The number of congregations affiliated with the UUA grew from 1,046 in 2011 to 1,054 this year. Ten years ago, the UUA had 1,038 member congregations, a net change of 1.5 percent." So just where did these 8 new congregations "affiliated with the UUA" come from and what does "affiliated with the UUA" mean? "Attendance at services dipped to 98,483 in 2012, compared to 100,693 in 2011. The UUA began tracking attendance numbers in 2006, when congregations reported an average attendance of 80,937. There have been gains since then, with a peak attendance number of 102,628 in 2009." These figures clearly show that actual attendance at UU Sunday services on any given Sunday is significantly lower than the full complement of adult members. Approximately 100,000 out of 160,000. Taking into account the fact that some of those persons of inherent worth and dignity attending UU "church" services are non-UUs of various kinds it would seem likely that fewer than 60 percent of adult UUs attend UU church services. "Enrollment in religious education programs dropped to 53,776 in 2012, down from 54,671 in 2011. Ten years ago, 60,540 people were enrolled in RE programs." So here is probably one of the most dismal UUA membership statistics of them all. . . Indeed Rev. Harlan Limpert, the UUA’s vice president for Ministries and Congregational Support, called this continued decline in UUA religious education enrollment a "discouraging sign" of the times. Within the last decade UUA RE enrollments have declined from just over 60,000 young people to under 54,000, a loss of well over 6,000 RE enrollments which corresponds to 11.2 percent of RE enrollments. Siddhārtha Gautama Buddha Kicks Shamefully Two Faced Unitarian Universalist Hypocrites In The Balls! U*Us do not act upon them?"